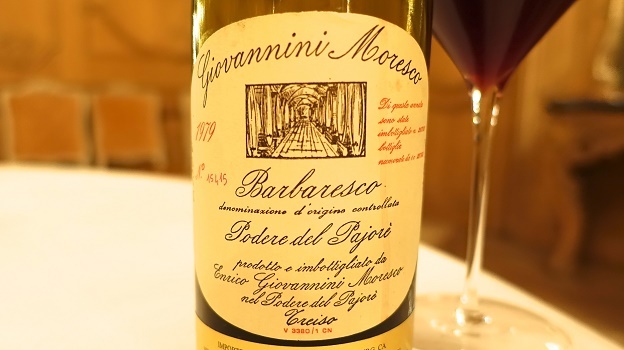 Giovannini Moresco’s 1979 Barbaresco Podere del Pajorè opens the door to a long-forgotten time in Piedmontese history. From 1967 to 1979 Enrico Giovannini Moresco crafted Barbarescos of true distinction at his small estate in Pajorè, in my view the best vineyard in Treiso. Giovannini Moresco sold his property to Angelo Gaja in the early 1980s and today, those vineyards go into Gaja’s Barbaresco. Although the Giovannini Moresco winery no longer exists, older bottles occasionally surface to remind us just how special these Barbarescos are, even today. Surprisingly powerful on the palate, the 1979 Barbaresco Podere del Pajorè retains incredible intensity for a wine of its age. Scorched earth, iron, smoke, exotic spices and dried cherries add nuance through the mid-palate and finish, where the 1979 truly becomes explosive. Firm, sinewy tannins support the fruit beautifully throughout. This is one of the most deeply personal expressions of Nebbiolo and Pajorè readers will come across. Sadly, the 1979 vintage has long lived in the shadows of 1978 and has been severely overlooked, except by savvy Piedmont fans, who know just how incredible the best wines of that year are. Giovannini Moresco may be no more, but the 1979 Barbaresco Podere del Pajorè is a testament to Enrico Giovannini Moresco’s enduring legacy. Because of circumstances beyond my control, I shipped this bottle to Europe and opened it just a few days after it had travelled across the ocean. While the wine was fabulous, I am quite confident that rested bottles will show better. The only question is how much better. 93/Drinking window: 2015-2025.